I hope you all have a wonderful day with your families and friends on this beautiful day. If you don’t observe Easter, I still hope you have a beautiful day – Sundays are days to rejoice for life in general. If you do observe Easter, then there is a good chance that you have a few (or many) boiled eggs lying around your home. Hopefully, if you’ve hidden eggs for any young kids, you were able to find them all. I think my parents secretly wrote down where all the eggs were – I imagine that there are households that begin to smell like sulfur a few weeks after Easter thanks to forgotten eggs. Hehehe oh well, right? All for the sake of the Easter bunny and the Lord. If you are looking for a recipe to help you use up some of those boiled eggs, I suggest you try this recipe. 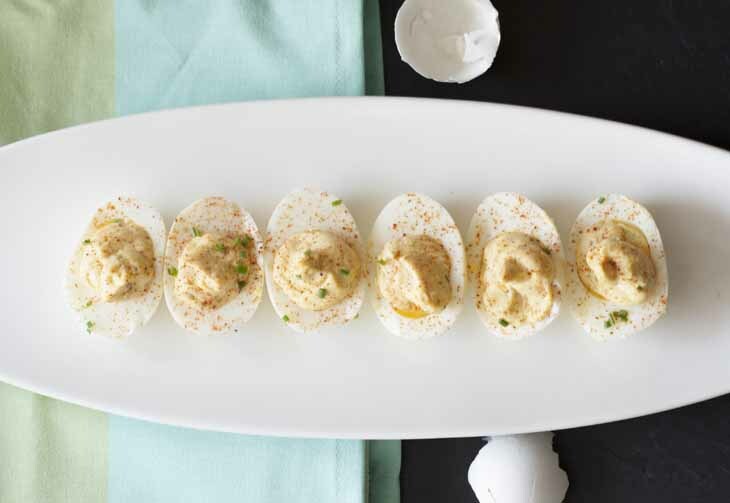 There are some amazing deviled egg recipes out there, but I have always been a big fan of plain ‘ole classic deviled eggs. I have the hardest time eating only 1 or 2 – even though my sometimes cholesterol problems mean I should not have any. Psha is what I say to cholesterol when deviled eggs are around. Sorry Dr. Z. if you’re reading this. I love my heart but my stomach loves deviled eggs more. When I fill my deviled eggs, occasionally I use a piping bag and cake decorating tips like I’m icing a cupcake. But… sometimes I don’t want to pull out the cake decorating box and I do the lazy route, like today. Take an empty plastic baggie, fill the bag with the yolk mixture using a spatula, and cut the tip off of the bag. Its your quick deviled egg filling fix. Slice the eggs in half lengthwise and pop out the yolks. Using a fork, mash the egg yolks. Fill the empty egg whites with the mixture. Garnish with the extra paprika and chives. Cover lightly and refrigerate for 1 hour before serving. Well, everyone, enjoy your Easter and I will back soon with some Mother’s Day goodies. 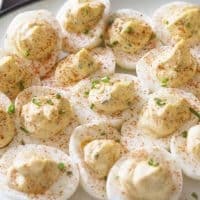 Deviled eggs are one of my favorite food any time of year! These look and sound so yummy! 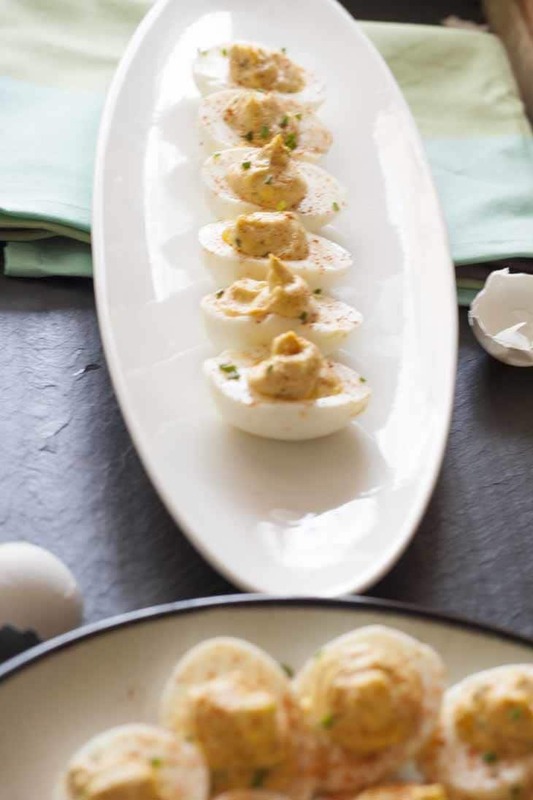 My kids love deviled eggs, and they are so easy to make, but I have not made them for so long. Thank you for your post … this gives me a quick meal idea for this week. 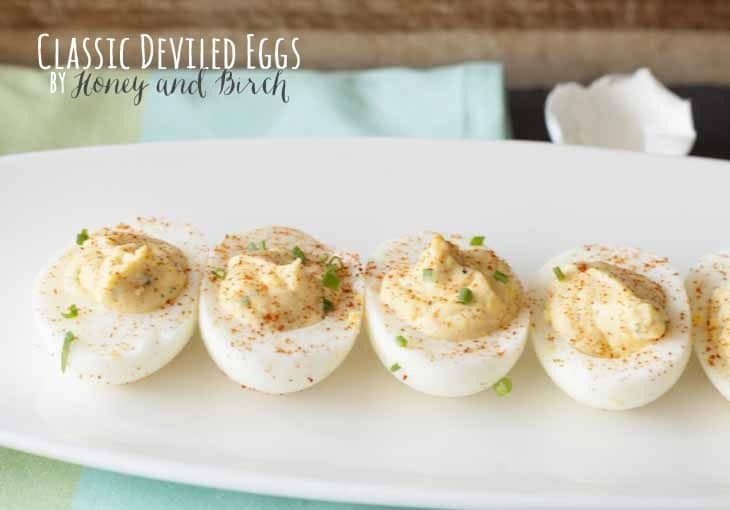 I love boiled eggs because they’re a good source of protein and are easy to make, but I have never tried making deviled eggs before! These definitely take eggs to the next level! Definitely going to give these a try! thank you i love my deviled eggs mmmmm.